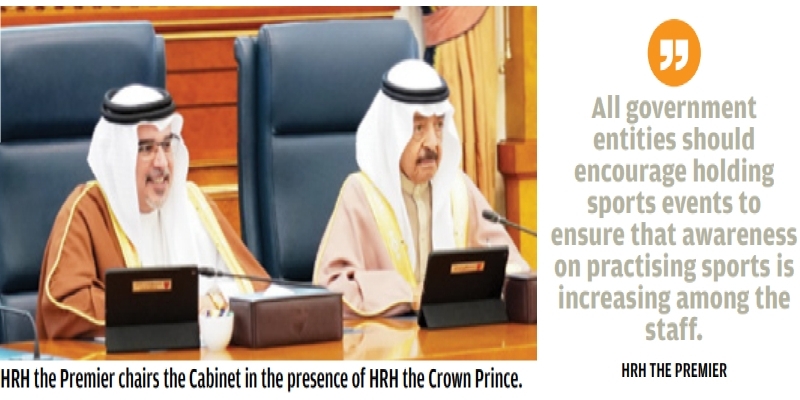 The Cabinet yesterday, chaired by His Royal Highness Prime Minister Prince Khalifa bin Salman Al Khalifa in the presence of His Royal Highness Prince Salman bin Hamad Al Khalifa, the Crown Prince, Deputy Supreme Commander and First Deputy Premier, endorsed a draft-law on “Rehabilitation Justice for Children and their Protection from Ill-Treatment” that will replace the existing law. The draft-law included non-conventional measures to prevent children from being taken away from their family environment and to protect them from ill-treatment and criminal accountability. Under the new law, rehabilitation justice courts will be established to hear cases related to crimes committed by children over 15 years old at the time of the crime, and a “Judicial Child Committee”, to be responsible for examining cases on children’s ill-treatment or exposure to risks, will be set up. The Cabinet, after being informed about the opinion of the Ministerial Committee for Legal and Legislative Affairs, decided to refer a draft-law on the issuance of a Law on the “Rehabilitation Justice for Children and their Protection from Ill-Treatment” to the Council of Representatives. Among other things, the Cabinet approved the amendment of certain provisions of the Code of Criminal Procedures to fast-track investigation, trial and prosecution procedures, allowing the Public Prosecution and the courts to adopt modern audiovisual techniques and transport in all proceedings and in assessing the statements of the witnesses. The amendments also ensure the protection of witnesses and develop easier solutions for precautionary measures, without prejudice to rights and freedoms. The session referred a draftlaw on amending some provisions of the Code of Criminal Procedures, issued as per Decree 46/ 2002, to the Council of Representatives. Among other things, the Cabinet reviewed the results of a study conducted by the World Health Organisation (WHO) experts to verify the risks of electromagnetic emissions from telecommunications towers.